Supplied to the 6th Earl of Coventry (d. 1809), for the Great Room at Coventry House, Piccadilly, in 1769, at a cost of £68.16.7½d, and moved to Croome Court circa 1848. Anonymous sale, in these Rooms, 19 November 1989, lot 101, (£18,700 inc. premium). 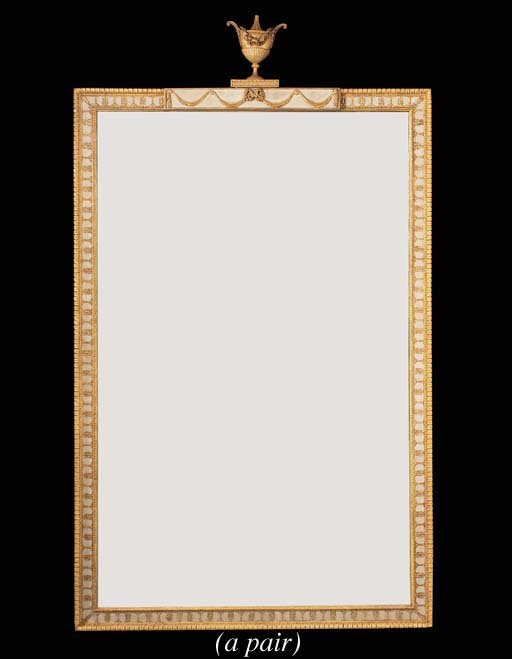 The huge mirror-glasses are framed in the antique style promoted by Robert 'Bob the Roman' Adam (d. 1792) architect to George III, and embellished in a festive Homeric fashion celebrating love and virtue. Golden flower-festooned urns, accompanied by beribboned sacred veils, are displayed on statuary white tablets above rectilinear frames. These are wreathed by Venus' pearls and Apollo's laurels, and these frame a palm-flowered ribbon-guilloche derived from the neck-band of a Grecian Ionic temple illustrated in James Stuart's, Antiquities of Athens, London, 1762. This frame pattern derived from one, with an urn-capped figurative medallion that Adam had executed in the same year for a 'Glass Frame for the Anti room at Shelburne House [now Lansdowne House, London]' (E. Harris, The Furniture of Robert Adam, London, 1963, fig. 18). The removal of the trophy ornament, apart from the vases, and the insertion of the bacchic veil-draped tablets no doubt reflects the refined taste of the architect James Wyatt (d. 1813), at the time that he was carrying out work for the Earl in the mid-1790s. In particular, their present urn-capped tablets correspond to the architecture of the 'Punchbowl Gates' executed in the manner of Robert Wyatt in 1794 at Croom Court (see A. Kelly, 'Coade Stone at Croome', Apollo, April 1997, p. 21. fig. 1). The furniture from Coventry House was sent to Croome Court after the 9th Earl assigned the lease in 1848.